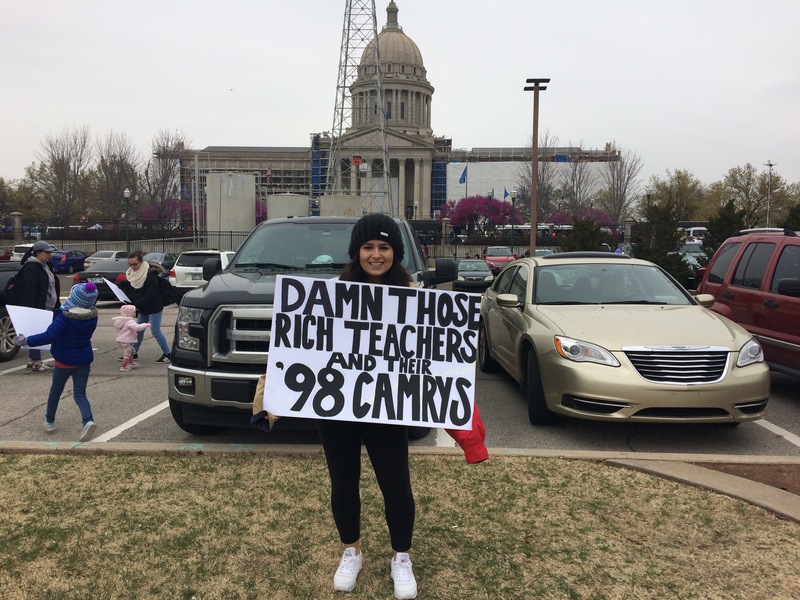 After spending Spring Break in Oklahoma, I wrote this open letter to the teachers putting up a fight for quality education in Oklahoma. My name is Tatiana, and I’m a student of Education living in New York City and a former middle school teacher. I spent most of my Spring Break in Oklahoma to report on your struggle for the website I write for, Left Voice. 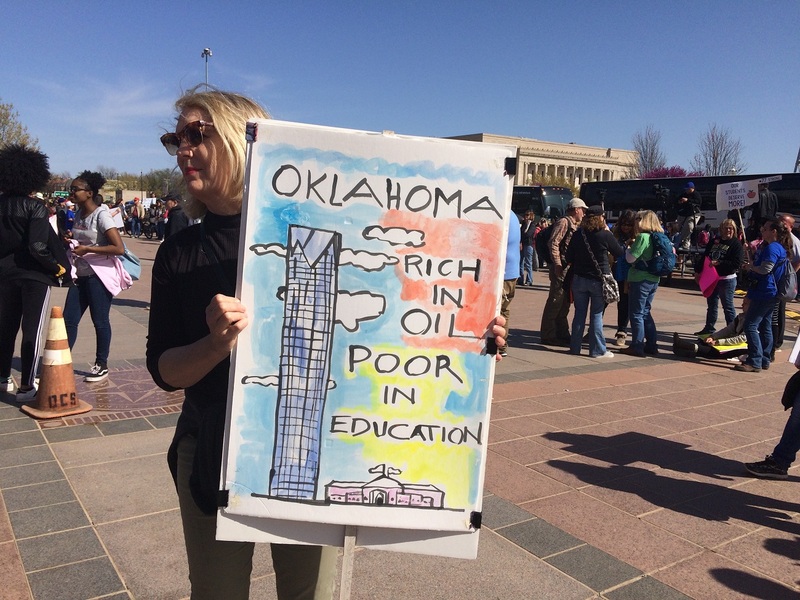 Far from a “paid outside agitator” — which members of the Oklahoma legislature claim exist amongst the the thousands occupying the capitol — I spent most of my time taking pictures and sitting on lawn chairs, drinking soda with teachers. 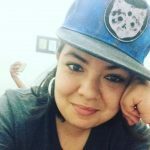 Far from a “paid protester”, I couldn’t afford to buy my own ticket to Oklahoma City, so I set up a gofundme, which got dozens of donations. 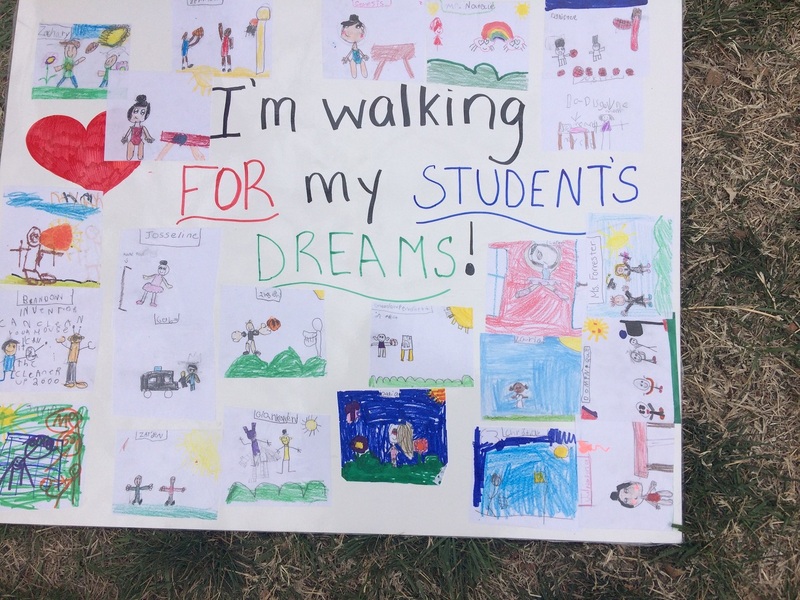 As a result, I was able to go to Oklahoma and spend a few days among the 30,000 teachers who occupy the lawn of the State Capital every day demanding higher pay for support staff and an increase in the state education budget. I can’t think of anywhere I would have rather spent my Spring Break. 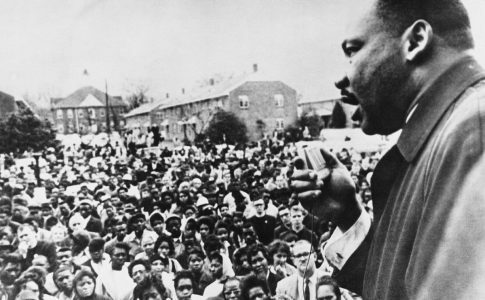 You are an example to teachers in the U.S. and around the world because you said enough is enough, and are standing up to your state legislature not only for your rights but also for your students. It’s my first time in Oklahoma, and before going there, I had never even eaten chicken fried steak — a problem that I remedied quickly after arriving! (It’s delicious!) Although I got to talk with dozens of teachers, I didn’t get to meet most of you in the few days I was at your walkout. So, I can’t claim to know you. I certainly can’t claim to know what it’s like to teach in a school where kids have to take pictures of textbooks to do homework or where teachers leave mid-year and a revolving door of substitutes take their place. But I was a middle school teacher for five years, so I know what it’s like to know all the songs your students listen to by heart — whether you like it or not. I know what it’s like to worry about whether Diane has enough to eat at home or whether Sheila is going to come in to school upset after visiting her dad who is imprisoned. I know what it’s like to spend large amounts of your paycheck on school supplies, purchasing that perfect book that Ana would love for your classroom library. I know what it’s like to think of creative ways to get your students involved, coming up with art projects, skits, music — anything to get kids excited to learn. So, when I see you, standing with your signs at the Oklahoma Capitol, I see your passion for teaching and for raising the next generation of thinkers. Given your ingenious signs, I see that you are funny and without a doubt bring that same creativity into your classroom to inspire young minds. I see that you are dedicated, riding the bus to arrive at the legislature every day just to have your voice heard — for you and for your students. I know that in your classroom, you bring that dedication to teaching every day, never giving up on that kid who struggles to learn or to behave. I see that you walked out not because you are “greedy” or an immature “teenager who wants a better car” — as your elected officials say. I see that you are in Oklahoma City because you want what’s best for your students and your support staff, because it is simply impossible to teach in the conditions you are in. Actually, I take it back. It is possible to teach in the conditions you are in; by walking out, you are also teaching. 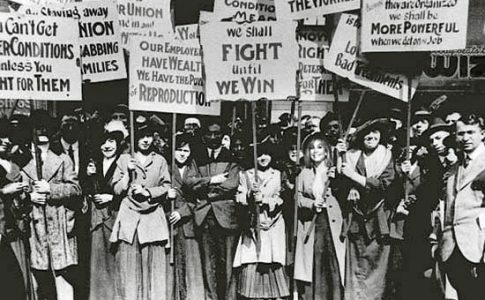 You are teaching your students that workers, when they stand united, are an unstoppable force. You are teaching your students that they don’t have to accept horrible conditions; they can work to change them. And you are creating conditions in which many of your students are becoming leaders and activists, organizing speakouts, bringing the school band to play in solidarity, or making a sign to hold at the State House. 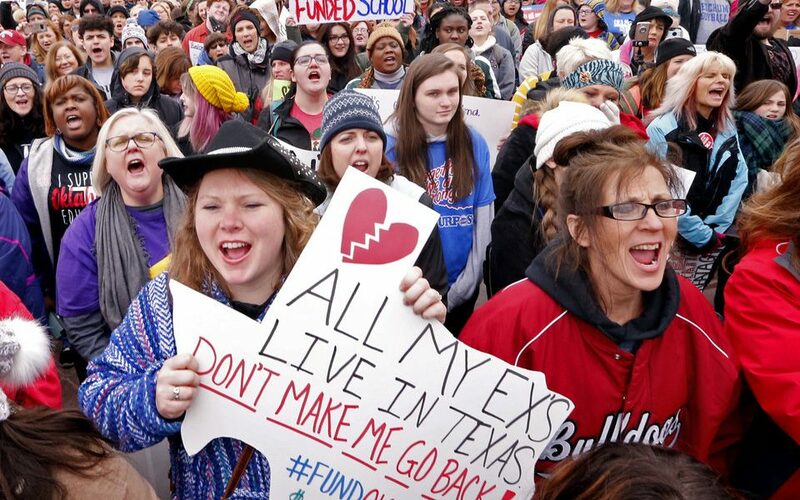 Make no mistake: Oklahoma teachers are teaching right now. Being with you, I learned a lot about how the Oklahoma government works. It’s not lost on any of us sitting on the State House lawn that the legislators seem to almost never actually be in. They get there late, they leave early, and many refuse to even meet with their constituents. Oklahoma state legislators make the 15th highest pay in the nation and work less than 80 days in the year. Teachers salaries, on the other hand, rank 49th in the nation for working 165 days out of the year. While the official school day is from 7:15- 3:30, countless teachers arrive an hour early and leave hours late doing unpaid tutoring, coaching, and supervising of extracurriculars. And yet, these legislators have the gall to call teachers greedy? I think politicians should make the same salary as a teacher. Why should they get privileges because they are legislators while teachers have to struggle to make ends meet? Another thing that struck me while I was in Oklahoma is the fact that it is not a poor state. When I drove in, I saw the fancy and newly built Devon Energy Center in the middle of Oklahoma City. 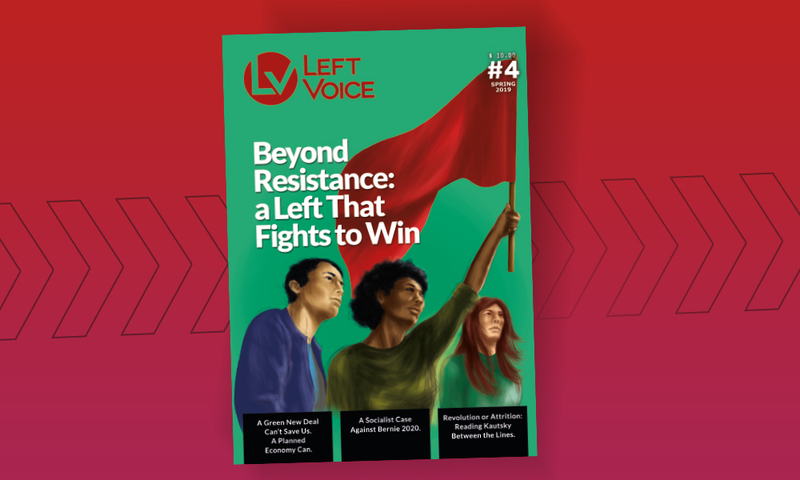 Rob Belano did some research for Left Voice and found out that while in the past 10 years education has been cut 28%, the fossil fuel industry has experienced a huge boom. This meant record profits for the oil and gas industry and massive wealth in the hands of a few people. Six Oklahoma billionaires today have a combined net worth of over $37 billion, far more than the entire amount spent by the state on education, health care, public services and transport together annually. Six people have as much wealth for themselves than all the money spent on education in the entire state! Some people (especially legislators) say that if fossil fuel companies get taxed, they will just pick up and take their business elsewhere. But Oklahoma teachers know that that’s just not true. As dozens of teachers said to me: “The oil and gas is in the ground! It’s impossible to pick up and leave!” In addition, one tenth of the country’s shale gas is in Oklahoma, so y’all have a good point! I think that with the strength of your walkout, it’s possible to change this. Every school in Oklahoma could have new and up-to-date books, as well as smartboards and ipads, and smaller class sizes. The fossil fuel companies could pay for education many times over. The six billionaires in Oklahoma could be taxed to pay for education, with the taxes going up along with inflation. Instead, the state legislature is talking about taxes on purchases from Amazon, which would effect the hard working people who already struggle to make ends meet. But the problem of underfunding for education and super-exploitation of teachers is not just in Oklahoma. It’s also West Virginia, Kentucky, and Arizona, where we have already seen teachers mobilize for their rights. Y’all are an inspiration to these teachers who, because of you, have the courage to say: Enough is enough! 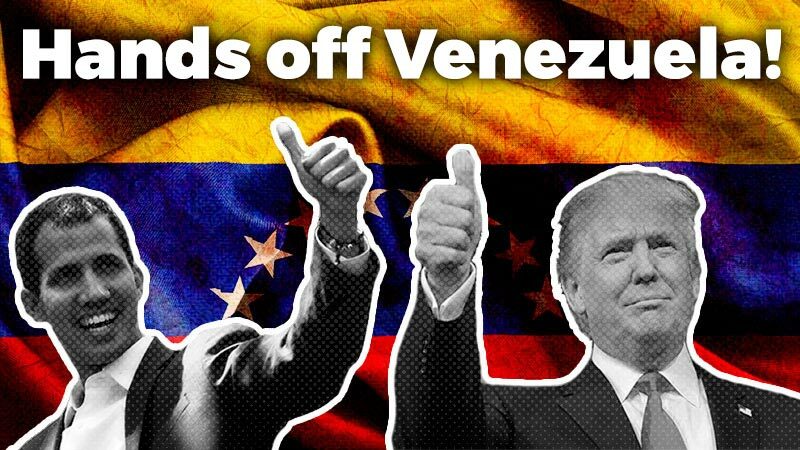 But the problem goes well beyond the states that have already mobilized. In New York, class sizes are also much too big, and teachers don’t even get paid maternity leave! That’s why I think that teachers around the country should follow your example to demand more funding, not just from our local governments, but from the federal government as well. The kids deserve a quality education, and there is more than enough money to fund it. I left Oklahoma, but my heart is still with you. Yet, I want to do more than passively support you from afar. 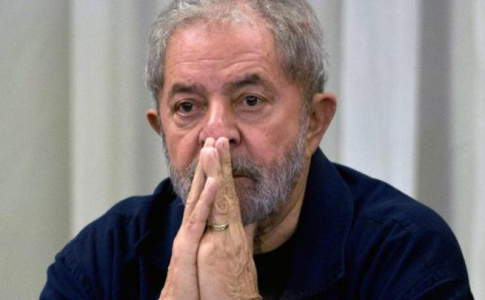 That’s why on Monday, in my class at City College, I will talk about your struggle with my students, and I will begin to seek out pictures and messages of solidarity for your struggle. That’s why we at Left Voice want to open our website for teachers who want to tell their stories about their our classrooms and their struggle. You teachers are so strong; you are so much stronger than the legislators in the capital. Society runs because of the work you do, so you are strong enough to win. I send you solidarity and strength. 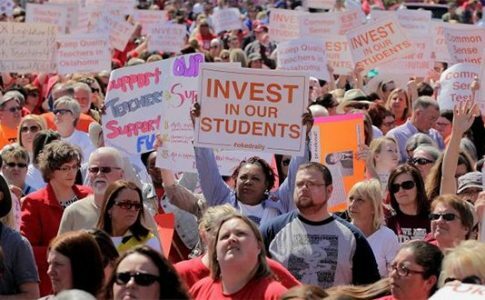 Left Voice interviews Bryan Dearing, Oklahoma teacher, about working conditions and the upcoming walkout.